Many months ago, my Thunbergia mysorensis (Mysore Clock Vine) grew so lush that vine shoots started climbing the guy wires that support a utility pole near the property's perimeter. Removing the vine branches from their firm grip on the guy wires was difficult. I thought of joining the two guy wires together with duct tape so the vine won't be twining either one of the two vines. See the photo below. It worked well initially. But then the duct tape joining the two wires started to deteriorate. The tape cracked and became torn. Much of it peeled away to the point that the garden vine shoots managed to slip through the torn flaps. Aside from being an eyesore, it became so ineffective that I had to severely cut back the now thick foliage of the garden vine. The removed foliage exposed the right side of the trellis as shown below. So I researched further and found a way to create a homemade yet effective vine control guard that I made from scrap materials. Here's a brief rundown and review of that success story. Thus far, I've not seen a single shoot that was able to wrap itself around the vine guard. Without the vine guard, the vine shoots could easily hold on to the 1/2" thick guy wires. Actually, the vine shoots have no trouble twining on structures that are 2" thick and below. The thinner the structure, the more difficult it is to pry away the vine stems that have entwined on it. The smooth surface of the vine control guard makes it difficult for the twining vine shoot to gain a reliable hold on it. With no grooves, cracks or ribs on the vine control guard, the vine shoots simply side downwards. The wide circumference and smooth surface of the vine control guard acts as a blank wall. Restricting of upward direction of growth due to a pulling effect. Adding more weight to the entwined shoots, which drops them down further. Because the vine guard is two feet high, vine shoots from the horizontal trellis won't reach the easily "grippable" guy wires. The vine guard's effectiveness therefore lies in preventing the vine from reaching the guy wires. Once the tip of the vine shoots reach the guy wires or any other vine structures, they quickly gain hold and won't let go. They proceed to wrap themselves continually on the entire length of the guy wires. When the vine has established itself on the guy wires, it becomes extremely difficult to pry away and remove the vine's branches. This is more so, when the vine takes over the structures on top of the utility poles like wires, cables and electrical components like boxes and transformers. When garden vines droop because they can't climb on any garden structures, they eventually rest on existing vine vegetation. As more vine shoots entwine with each other and drop, a layering of vegetative growth occurs (see photo below). This is a scaffolding effect that can allow top level garden vine shoots to piggyback on existing layers. 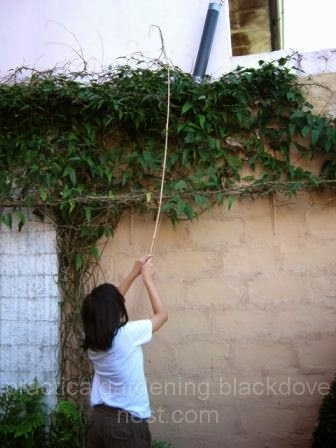 Eventually, the topmost garden vine shoots will reach and take hold of the guy wires. It is important, therefore, to be vigilant before this happens. At this point, you could pull or push away garden vine shoots that attempt to twine or are just twining on one of the guy wires. 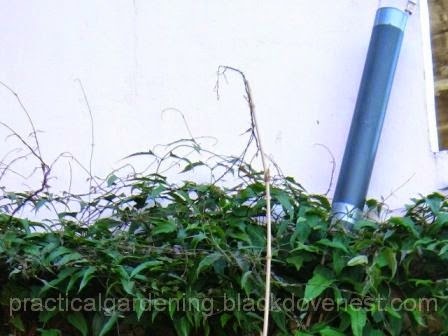 In the photo below, a very light and thin bamboo pole was used to pull away some wayward vine shoots that have found their way towards the to of the vine control guard. One of the nodes on the bamboo pole can be used as a hook to pull away the shoots from the vine guard. After pulling away, the vine shoots simply drop on the rest of the vine foliage. Here's a detailed photo on the pulling away of the garden vine shoots from the vine control guard. Ultimately though, the vine would need some serious cutting back especially in this area where the guy wires are located to ensure the garden vine's growth is trained and contained.